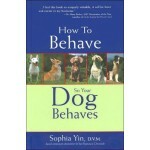 This book has 1001 dog care and training secrets! The tips are organized from A-Z for easy browsing. They include a wide range of care and training tips on hundreds of topics including: Body language, common commands, feeding, health, house manners, puppies, problem behaviors and much more!